Quang Ninh has been considered as one of the four major tourist centers in Vietnam with its famed and scenic Halong Bay, twice recognized by the UNESCO as the World Heritage Site thanks to its global value of landscape, geology and geomorphology. The province is also the home of famous landscapes in Vietnam such as Yen Tu Pagoda and Tra Co Beach, Bai Tu Long Bay, Tra Co Beach, Co To Beach, Dai Beach in Van Don. Being one of the most important international border gates in the north of Vietnam, Mong Cai city in Quang Ninh province has great potential for the development of border travel. The tourist potential is fully and effectively exploited in this area. In recent years, the number of tourists come to Mong Cai has considerably increased. 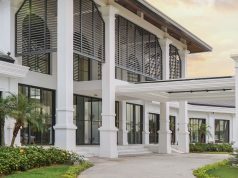 Located on sands meticulously planted with grass along the West coast in Gulf of Tonkin and the northern border area between Vietnam-China, in the heart of the romantic Tra Co beach, which is a famous holiday and sightseeing resort in the country. Because of this, Mong Cai international golf course was built and opened in summer 2008 to serve the game of golf in the purest sense. This is the first coastal golf course in our country with two separate courses: one for practice and the other for tournaments. Mong Cai International Golf Club is built to meet international standards, along a 3-km-long coastal stretch. The international standards of the links style combine with very fast firm fairways, constantly changing direction of wind, high level of difficulty and challenge make it the real test for those who want to get a par, birdie or just finish the round. The 18-hole course measures a total length of 7,204 yards, the carpet-grass covers an area of 200 hectares. The preeminence of Mong Cai International Golf Course that other golf courses cannot own is the uniqueness of geographical location and topography. Although recently opened in 2008, the course has attracted hundreds of golfers in the country and abroad to participate. 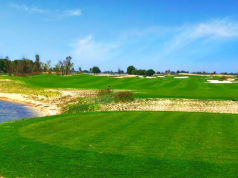 When coming to the Mong Cai International Golf Course, visitors will be connected to tours in total harmony with the relationship of Quang Ninh and Mong Cai tourisms. Address: Tra Co, Mong Cai, Quang Ninh, Vietnam. Keyword: mong cai golf club, mong cai golf course, mong cai international golf club.